The pattern is Felted Clogs by Bev Galeskas and it is a very easy pattern. I used the Baby Alpaca Wia Twist for the green , but I think I will have to go with a darning needle and put an extra thread in some areas that look week or empty. The sole is going to be fine. I used some Cascade Eco wool with some Paton's Classic and some mohair in there as well. Here is the top, the bottom of the clog gets a double sole then you make like a bumper around , so the end product will be a very cool looking clog. 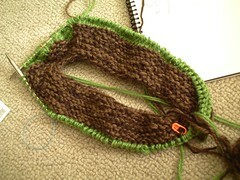 I am actually thinking of using some mohair that I have in green and make some stripes and just go wild , lol! At the toe Area some more material is needed. I did not realized until the end that the green yarn is DK instead of worsted and it is a bit thin, but with the addition of the other yarn it will work fantastic. l I won't know what to use to make it felt better until Iam done with the second clog, I won't know what I am actually going to do with this pattern to make it more me. This is it for this moment, there is more to be done and this is a very addictive project. As you can see this clogs are huge before they get felted, thanks for stopping by!